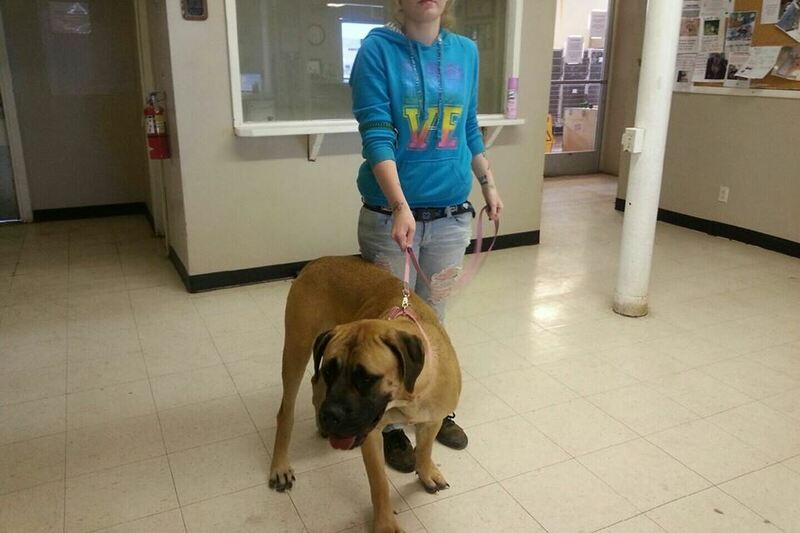 In October I posted this picture of a female Mastiff in a high kill shelter that needed a home ASAP. We were out of town while this was going on and I could not just go pick her up like I normally would have. Also since we are not an official rescue we do not have a 501c and can not pull dogs that have not been fully processed. (meaning spayed etc). So by phone I negotiated her purchase, her spaying and transport from Barstow to San Diego. Her designated Foster Mommy could not pick her up from transport so I had to arrange secondary care for her on the fly. She was picked up by a doggy angel named Sarah and taken into her rescue. THANK GOD she took her in because it turned out she was internally bleeding. The veternarian who had spayed her missed a blood vessel and she was still bleeding. Sarah got her to the vets immediately and saved her life. Sarah did NOT know that this dog’s name was Hope at the shelter and in turn named her Hope again. It turned out Hope was a real sweetheart and anyone who met her immediately fell in love with her. While I was still traveling, I received an email from a family who was looking to adopt a mastiff. They told me about their family dynamics and if I knew of any dogs looking for a home, I immediately wrote back and suggested Hope, I felt she would be a perfect fit. Well this weekend, the family went to meet Hope and it was a very successful match. Hope now has an amazing family to call her own. If you felt that Hope’s story is miraclous already WAIT until you read her new family’s email. Hope is a miracle dog and this family was meant to be hers. There was a higher power working for Hope this whole time and it can not be ignored. “Hi Angela. We indeed went to meet Sarah last Saturday ( lovely lady, you were right) and we adopted Hope! She is amazing and is doing great with our 9 mo. old Bullmastiff, and our two grand daughters. Now, there is an amazing story behind this adoption. Let me tell you, because this does not happen everyday. On October 13th. we were on the road, returning to San Diego from our nephew’s wedding in Salt Lake City. Around 4:00PM we were crossing through Las Vegas, when I heard the email ringtone in my telephone announcing a new message in my mailbox. I checked the incoming email, and it happened to be an email from you, to all the members of the SD Mastiff group, announcing that a female Mastiff had ended up in a high killing shelter and needed adoption asap. Since we had been talking about looking for a female companion for Zeus ( our 9 mo old puppy), we thought that it may be worthy to take a look at this opportunity before buying a young pup. I saw that the female was at the Barstow Humane Society, and since we had to pass Barstow on our way to SD, we could take a look at her. The more I thought about it, the better I felt about that dog. The feeling soon became almost an obsession that SHE was the dog for us. Since October 13 was a Sunday, I convinced my husband to stay in Vegas that night, so we could reach Barstow on Monday , and visit the Humane Society. To my dismay, Monday morning I called the Humane Society to inquire about the dog, but the Society was closed on Mondays, so I left a voice message on their phone asking them to please contact me asap about the dog. By the time we reached Barstow on Monday afternoon, my feeling about that Mastiff had grown so strong that I begged my husband to stop by the Humane Society even when I knew it would be closed… I felt that , if this truly was the dog for us, a miracle would happen and somebody will be on duty, or cleaning the kennels, or who know what, and maybe we could get our feet in. But my “hope” was in vain, because there was nobody on the premises. To tell you the truth, what we saw inside the quarters was not very appealing. The Barstow Humane Society does not look at all like our Humane Society here in San Diego! . Nevertheless, we went into the adjacent Vet Clinic to inquire if they knew anyone we could contact regarding a female Mastiff dog for adoption. They were very cold and not friendly at all, and of course, did not facilitate any information about the personnel in the Society – which we understood. Just in case, I left a note at the H.S. office door expressing my desire to adopt that female Mastiff. The next few days, already in San Diego, I called again several times, but there was no answer. They never returned my calls, until several days later, to let me know that the dog had been adopted. So I decided that my instinct had been a false alarm, and I started looking somewhere else for an adoption. But it was almost mission impossible to find what we were looking for. The only good choices for us were in other States, too far away to drive. 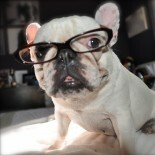 So we looked at local breeders and started considering the purchasing option… And all of a sudden (duh!) I thought that if there were Mastiff dogs for adoption in San Diego , the people of the San Diego Mastiff Group may know. Thanks to your email, I got in contact with Sarah and arranged a visit to meet the female Mastiff she had up for adoption. I stayed in the car , arranging some things, and my husband went to Sarah’s door to initiate contact. I saw them talking, and soon both returned toward our car with Hope, the female Mastiff. Incredible! Isn’t it? Who says miracles do not exist? She is the perfect companion for Zeus, and is such a wonderful addition to our home that she fitted in from the moment she walked through the door. It truly feel that it was meant to be that way. There is something extraordinary about Hope. Thank you so much for the referral, Angela. Best wishes for you and your loved ones. I have rescued animals for years and I often tell people the dog will choose their family I have seen it happen over and over again. This story however stands out in an incredible way. I look forward to finally meeting Hope since her family is now a part of our Mastiff Group and family I will have that opportunity very soon. Hope really is a very lucky girl. I want to give a special thank you to Chuck with Desert Rescue for picking Hope up for us. The work he does is thankless and he is one of my doggy angels. Also a HUGE thank you to Sarah and her rescue for taking in Hope and getting her the medical treatment needed to save her life. Without Sarah there wouldn’t be a happy ending story to post here today. Thank God for doggy angels like Sarah and Chuck the world is such a better place with big hearted people like them in it. What a wonderful story!!!! Yea Hope!! This entry was posted on November 5, 2013 by aadubadu in Community Spot Light, Dogs, Editorial and tagged Bullmastiff, Chuck, Dog, englishmastiff, giantbreed, high kill shelter, mastiff, miracle dog, Monday, rescue, rescue dog, Salt Lake City, San Diego, United States. aadubadu on A Puppy A Puppy!! small dog that barks… on A Puppy A Puppy!! GoddessJessi on Who is my match?